This is my Shrine at 4pm on a weekday. There was one other person behind me at the flight point. The realm I first started playing on (and the realm where most of my characters still are) is Eldre’Thalas. This has been listed as a ‘Medium’ realm since I started playing in late Wrath. I think Medium was a correct description for it throughout Wrath and Cataclysm. Maybe even at the start of Mists. I don’t think it is now though. I am not a raider, so I don’t know if this is due to lack of raid guilds or what. I do know a few big ones left the server towards the end of Cata though. Anyway, my hours of play are strange. I tend to be on at around 3am on weekdays and then a lot during the weekend. Occasionally I am on a few hours in the afternoon during the week. This year I started noticing a lot fewer people on at 3am, but you know it is 3am so I didn’t think much of it. Halfhill Market at about 4pm during the week. I have never seen it so empty. Then I started noticing formerly busy places like Halfhill resembling ghost towns. I am used to the Market having so many people that it is hard to interact with the NPCs. The last few weeks that has not been a problem. So I decided to check out my Shrine in the Vale. The red dots indicate people I saw. There are nine in this picture including me. Counting everyone I saw in the entire shrine it comes to about sixteen. I realize I was checking in the afternoon, but it was so…empty. I am used to seeing other people out and about. Maybe that is because a lot of my kids “live” in Dalaran which is a crossrealm zone. I was surprised to see so few people in the end game city of this expansion. I decided to check other places on various alts. The most obvious place to check was Stormwind. This is the Stormwind Dwarven District. 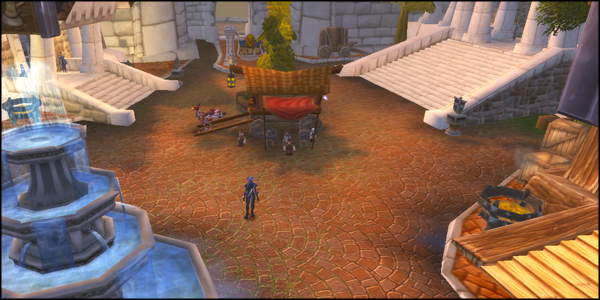 To the left you see the auction house and across from it is the bank. I have never seen it this empty. So the Dwarven District was almost completely empty. No one was in the auction house. One person was in the bank and two people were at the blacksmith trainer/vendor. This is not normal even for a weekday afternoon. In Cata I usually saw 5-6 people at the very least at 3am when I was doing cooking and fishing dailies. This is the Stormwind Trade District. I am standing on the steps of the bank and looking into the auction house. The Trade District was a bit better. There were several people idling around the fountain. People were in the auction house and the bank as well. Here is the issue, the scene above is what the Dwarven District used to look like every day. The Trade District used to be so full of people that it would lag me out. People were everywhere and hanging around on flying mounts too. Today that was not the case. So…it seems pretty obvious to me that my server is dying. I expect some of this sudden emptiness is due to the recent sale on character transfers. I’m not sure how bad it is on the auction house. I’m not a big spender and I don’t buy a lot so I can’t compare. I suspect it probably isn’t good though. Ironforge has been instanced for me ever since crossrealm zones became a thing. 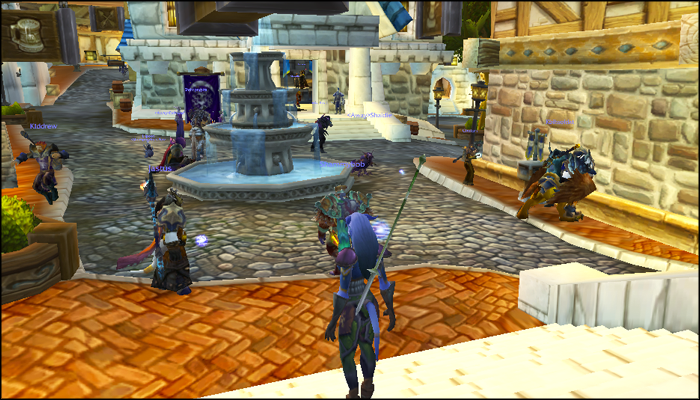 My bank alts are based there so I had no idea that the bank districts in Stormwind were becoming empty. My level 85-plus alts are all living in Halfhill as well so I don’t really know if the empty Shrine is new or not. I just know that today freaked me out. I don’t enjoy only seeing NPCs in a major city. It feels very eerie. That combined with being the only person on in my guild for over three hours was bad. I am not sure if the new virtual realm will fix these problems or not. It seems to me that Blizzard is basically merging servers while calling it something else. CRZ has had a lot of problems and I’m worried that this will as well. However I also think that very few realms that are listed as Medium really are. I am on a couple of other Medium servers and they seem to be in better shape than Eldre’Thalas. The visible population is still kind of low though. It makes me wonder if they are also on the decline and just not as far along yet. Can virtual realms stop this decline? Looking at my empty realm, I think it is definitely time to see. I have my concerns with Virtual Realms, but I think it will work out OK in terms of populating servers with people we can interact more with. The biggest challenge Blizzard has is “keeping the pond stocked”. You and I (and other altoholics) will keep rolling toons until we eventually max out our character slots. But lots of people check out long before. Very nice write up. Your screen shots really hammers it home. Hopefully it’s just a summertime lull before the next patch. Empty Stormwind was really weird to see. I think Halfhill shocked me the most though. 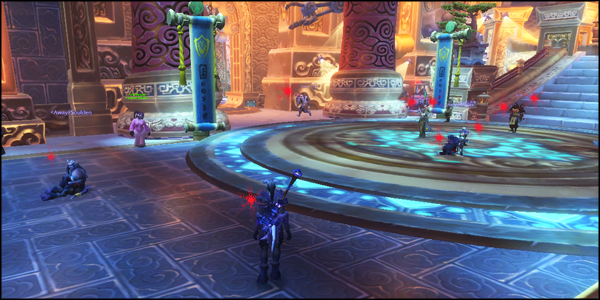 The only emptier city I found was Darnassus and it is even CRZ. I worry as well but something has to be done. I often play at odd times (due to work) so I didn’t really notice how quiet and empty my server had become. Now that I have a bit more time to play, I’ve realized that everywhere on my server (even cross-realm) is a ghost town. It’s really depressing and certainly makes me not want to play. It was bad enough when all my old friends stopped playing but now there are no new friends to meet either! Thank you! I love T10. The Stormwind empty view like in posted picture is something I see each day at peak hours, not 3 am. My server is second to last least populated EU PVE server. It can only be better once vitrual realms go live. Good grief, and I thought US-Malfurion had it bad on the Horde side. But yeah, I really sympathize with your situation. My main realm is still classified as “medium”, but it’s towards the lower end of the range. 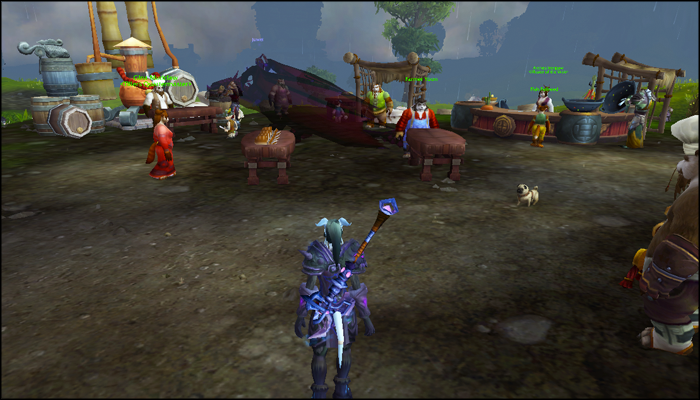 The Vale is very subdued, and trade chat can go half-an-hour easily at times without anything being said. Alliance side it’s a good deal better, but still the realm does not come anywhere close to its glory days in WotLK. Sad to say, but WoW will end someday. It hasn’t helped that during its current 8+ years of life that a new generation of gamers has arisen, that have adopted F2P and such as their primary focus, while we who grew up on D&D and EverQuest have to make room in our lives for other things such as careers and family. Reminds me of the Teen Titans series finale that was aptly named, “Things Change”. I’d say it’s very applicable here. I can see your server does look pretty low in population. Is your guild active? Do you have people to chat with when you log on? Or is the guild activity low as well? It depends on when I log in. On the weekends there are almost always at least a few people to chat with. But we rarely have even three people on to do scenarios and never enough to actually raid. Most people have left. If no one is on, I go visit my other guild on a different server that is much more populated. I see. I am in the same situation as you. My server is pretty empty, I’m the only one in my guild. I’m thinking of transferring, but I want to wait until 5.4 hits to see how the VRs workout and if they make things better. Truth be told, it’s more about when you log in. We do have people come in late at night (by Pacific time), weekend or weekday; when we do have enough to do a scenario, one or more guildies are already in LFR (myself included); or, frankly, would rather work on a lower level toon (either in the guild or on another server, usually the former). I’ve seen a few people that I haven’t seen since Cata swing by and play; I know of 4 people who just rejoined in just the last 2 weeks (but only 1 that can even do a heroic scenario now). Heck, I have felt bad of late; usually at this point in an expansion, I’m spending time with lower-level guildies doing dungeon runs (esp Nexus and Violet Hold). Since it’s now gear-or-die, I’m either waiting for LFR, in LFR, or just out of LFR, and haven’t done many dungeon runs at all. Or frustrated enough with the day that I don’t bother logging in, or do so just to check in on guild matters (pending guild invite, guild log, say hi to whoever is on and see if they need anything, etc). My main driver of late is that I can level a pet from 1 to 22 in a day; from there, I convince myself to some farming, and then possible LFR… But I digress. One of most reliable and dependable guildies has been over on another server playing Horde side of late, levelling a new toon. Why? When I asked her if she was up for scenarios, the long and short was that she really didn’t like the end game content. (She was pretty upset about how Blizz nerfed her main class to boot; something I do share my feelings with.) Her thing was about leveling more toons. She was instrumental to the guild at the end of Cata–we had a regular 4-person team running dungeons each night, and she was one of them (and switching between her alts to help gear them up). And, honestly, I don’t blame her; I’m not all that keen on the end content myself. But that’s the consequence of an altoholic-heavy guild playing an expansion that isn’t all that alt-friendly. People will either focus on lower-level kids, hit 90 and move to the next toon, or not play at all. We’ve seen all three. And, to be frank, I’m not expecting Virtual Realms to fix anything. It’s the content that’s killing the population. I see it like a restaurant that once served the best burgers in town that now changed its recipes to be mostly sawdust; sure, you can increase the size of the dining room, but that doesn’t mean more people will come in for your grey, thin patties of “meat”. Likewise, I don’t see VR’s being the bastion that saves WoW. Provide better content–as well as a better gaming environment–and the clientele will return. Exhibit #1 is CRZ. Very few people I’ve read actually praise CRZ; many more scorn it. And it isn’t because “Oh, I can’t get invited to so-and-so’s guild” or “I wish we could all be one AH.” I see very little difference between it and CRZ from a practical standpoint. And as far as guilds go on that server? In LFG, a whole lot of dead and/or small and/or low level guilds, not unlike ET. And I doubt VR is going to resolve that in any substantial way. Until Blizz makes changes to its content and the environment it fosters for strangers, guilds will wither, more people leave the game, and there will be fewer and fewer people to interact with; and those that do will be anonymous and act as though they are not accountable for their actions. Anyway, that’s my perspective. Or a few of them. Take them for what they’re worth. I know I’ve taken a lot of detours here, and there’s probably something worthwhile within.